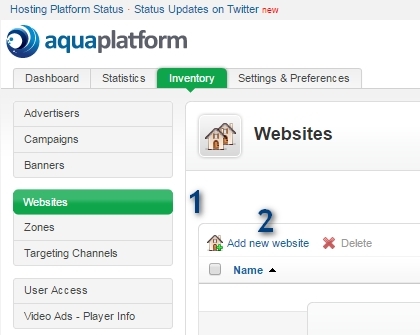 OK, so you opened a brand new Revive Adserver hosting account at Aqua Platform? Or you recently joined a company with a pre-existing Revive Adserver account, and you want to get up to speed quickly? This tutorial will show you how to get started, you will have your first banner displaying on your website in no time! Click any of these steps to jump straight to the section. Clicking any of the images below will reveal the full image for easy viewing. Note: Even though you can view this Getting Started page just fine on a phone or tablet, the user interface of Revive Adserver itself works best on the comfort of a larger screen like a laptop or desktop computer. Delivery of ads on mobile devices works perfectly fine, by the way. After you first log in on a brand new Revive Adserver hosting account, you will be greeted by what might seem like a somewhat intimidating empty screen. Unlike a word processor, where you can just start typing, things are a little bit different when you begin using Revive Adserver. Don’t worry, you’ll be creating a few items and will have your first ad displaying in no time! 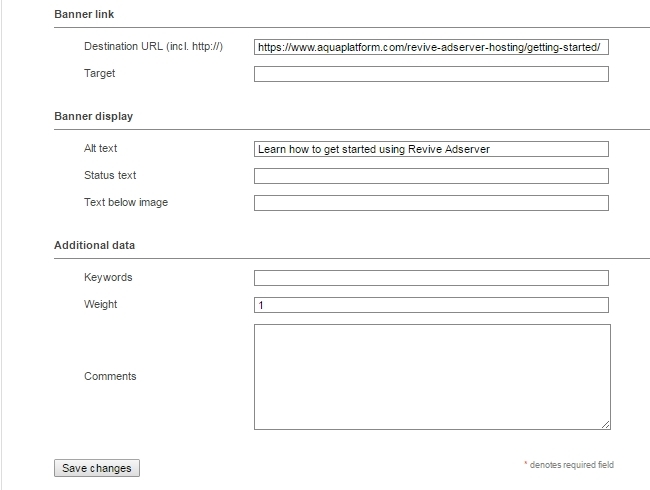 In Revive Adserver, you can define one, or two, or as many websites as you want. When you first log in, you will be in the Inventory tab. If you’ve moved around a bit to see what else is available, return to the Inventory tab now. Click the Websites link in the left hand menu, and then click the Add new website link in the middle region of the screen. Entering the URL, while mandatory, does not imply that the site is going to be checked. You can use the invocation code you create later on in this tutorial on any website. 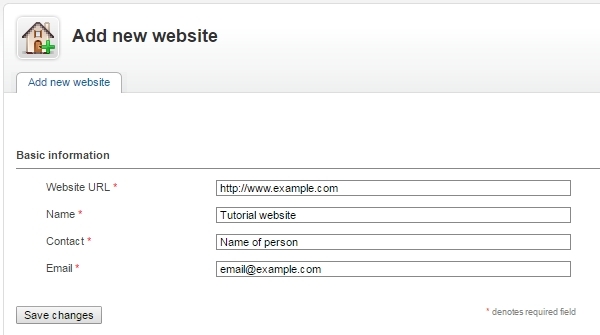 Make sure to enter a good website name, as this will be visible later in the lists of websites and in the statistics. Keep it short but descriptive. You must enter a contact name and e-mail address, but these are not actually going to be used for any functionality. After you’ve entered everything, click the Save changes button. When the new site is saved, it will show up in the list (a very short list at first), and there will also be a message with green highlight to inform you about the new site and provide a link that enables you to add a new Zone for the site. That’s the next step. In Revive Adserver, a Zone is the representation of a place where an advertisement can appear on a webpage, or in a template that defines an entire set of webpages for a site. 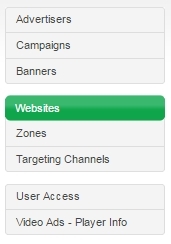 If you’ve just added your first Website (see above) then you can now click the Add a zone link in the green notification. If you’ve returned to this tutorial later, and the green notification is no longer visible, you can also click the Add new zone link on the right hand side of the list of sites. For the Name, enter something that’s short but still descriptive. This name will appear in the list of zones, and also in the statistics. A good name will make it easier to recognize later. The Description is not mandatory but can be very useful when you have a longer list of zones for one website. In this tutorial, select Banner, button or rectangle for the Zone type. 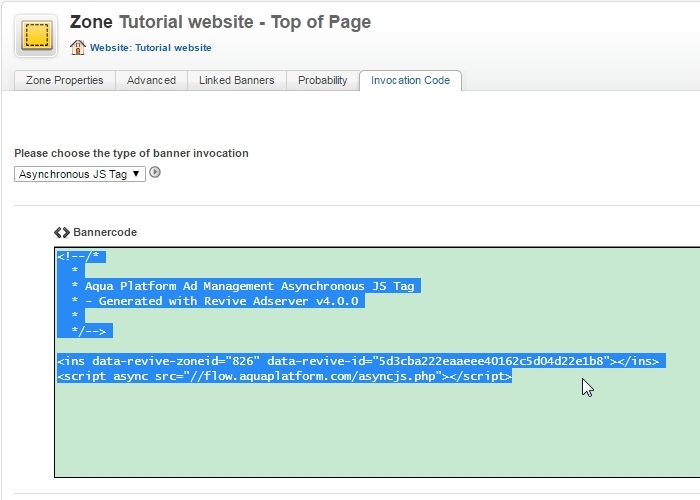 Select one of the pre-defined Size options, in this tutorial it is assumed you will use the IAB Leaderboard (728 x 90). Once you have entered all the settings, click the Save changes button. Your new zone will be saved, and it will show up in the list of zones. From here, you could continue to create more zones, but for this tutorial, we need just one zone. You will return to this page at the end of this tutorial to grab the zone’s Invocation code. The point of using an ad server, is to be able to display the advertisements for your advertisers. Let’s create the first advertiser. While you’re still in the Inventory tab, click the Advertisers link in the left hand menu, and then click the Add new advertiser link. For the Name, enter something that’s short but still descriptive. This name will appear in the list of Advertisers, and also in the statistics. For the Contact and their E-mail, you could enter the advertiser’s details. Be aware, though, that if you enable either of the two checkboxes below, Revive Adserver may start sending e-mails to that e-mail address. Discuss with your customer first if they want to receive those e-mails. As an alternative, you could enter the name and e-mail address of the sales person in your own organisation who is responsible for this advertiser. All other fields and settings on this form are optional, for this tutorial, just use the defaults. Clicking the Save Changes button will store the new advertiser in the database. You will return to the list of Advertisers, and a notification in green informs you that the new advertiser has been created. You can use the link in the notification to Add a campaign, which will be the next step. 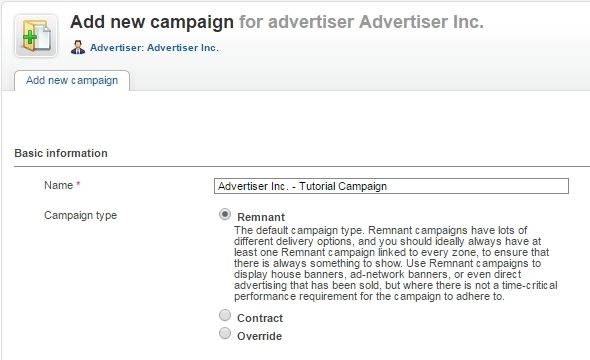 In Revive Adserver, a Campaign represents the agreement between you and an advertiser to show their ads, and it contains the details of that agreement. It’s about things like start date, end date, how often the ads are to be displayed, and so on. If you’ve just added your first Advertiser (see above) then you can now click the Add a campaign link in the green notification. If you’ve returned to this tutorial later, and the green notification is no longer visible, you can also click the Add new campaign link on the right hand side of the list of advertisers. For the Name, enter something short but still descriptive. Do not leave the suggested “default campaign” as the name, if all your campaigns would be called that same name, it will be impossible to distinguish between them. 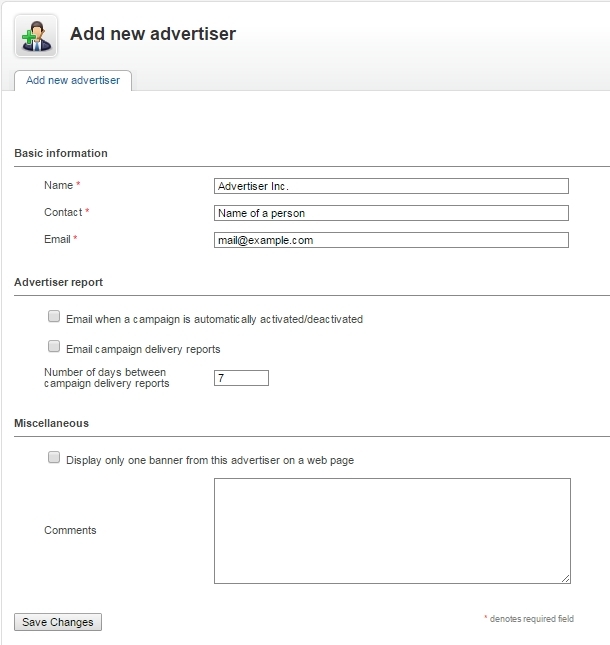 It might be smart to follow a pattern like “Advertiser name – Campaign Name”. For this tutorial, select the type as Remnant. As soon as you make that selection, the rest of the form appears with the relevant fields for a Remnant campaign visible. 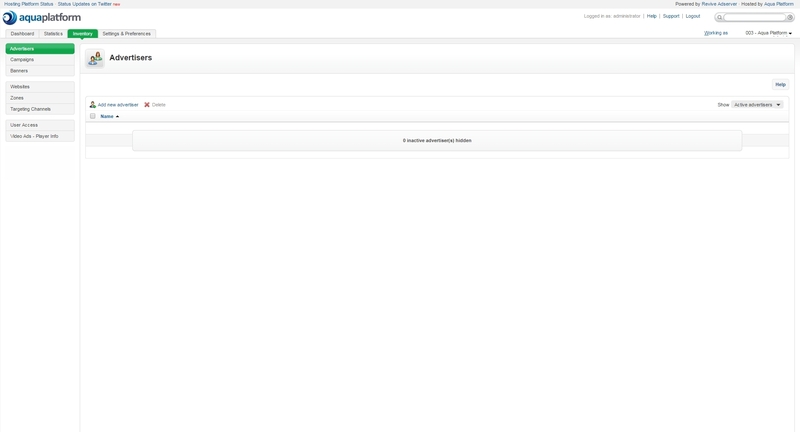 Now enter the rest of the details for the campaign, using the defaults presented automatically. The remnant campaign for this tutorial will start immediately, and it has no end date. 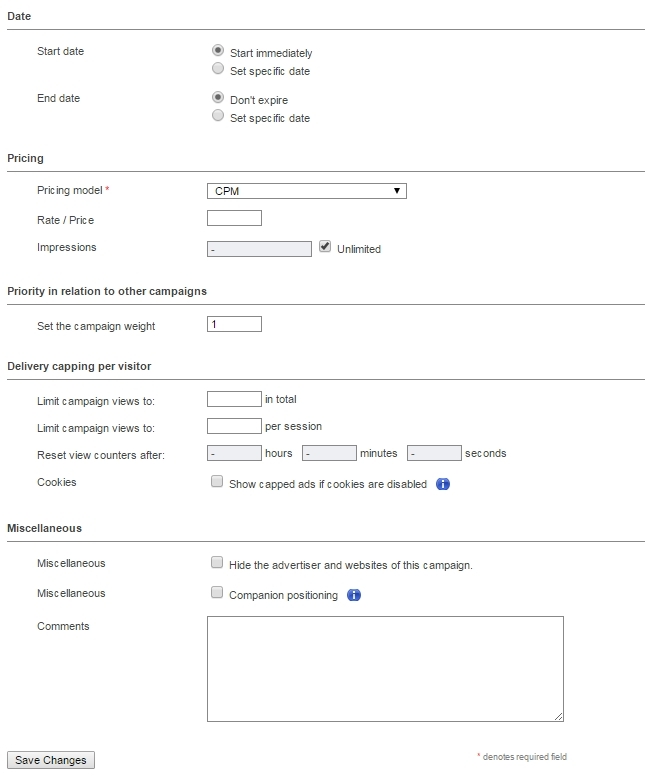 No pricing information is needed, and since it is the only campaign for the time being, the campaign weight relative to other campaigns can be left at ‘1’. Do not enter or change anything for the delivery capping either, and don’t select any of the checkboxes. You will notice that despite the somewhat intimidating form, making a remnant campaign is very simple. Just enter the name, select type Remnant, then scroll down to the end and click Save Changes. The system will store the new campaign in the database. You will return to the list of Campaigns for the advertiser you’re working on, and a notification in green informs you that the new campaign has been created. You can use the link in the notification to Add a banner, which will be the next step. If you’ve just added your first Campaign (see above) then you can now click the Add a banner link in the green notification. If you’ve returned to this tutorial later, and the green notification is no longer visible, you can also click the Add new banner link on the right hand side of the list of campaigns. For this tutorial, leave the Type of banner as the default, which is to upload an image file. For the Name, enter something short but still descriptive. It might be smart to follow a pattern like “Campaign name – Banner Name” where banner name could represent the description of the various sizes of banners in your campaign. Click the Choose File button to select a banner that’s stored somewhere on your disk or on the network. Once you’ve selected it, the name of the file will appear to the right of the button. If you don’t have a banner image available, please use the button to download an example file so you can use that for the tutorial. Enter the Destination URL, which is the address someone will go to when they click the banner after seeing it on a website. In other systems, this may be referred to as the Landing page. It is not mandatory to enter a URL, but banners that can’t be clicked are very rare. Leave the field Target empty, which means that when the banner is clicked, the destination URL is opened in a new browser window or tab. Optionally, you can enter the Alt text that will be displayed when someone hovers the banner with their mouse, or by screen readers that are used by people with poor sight. Leave all the other fields at their default values and click the Save Changes button. The new banner will now be saved in the database, and the banner image will be uploaded to the server at the same time. A notification in green informs you that the new banner was saved. There is also a preview of the banner, so you can quickly identify each one when you’ve created multiple banners in the same campaign. There are just two steps left now: link your campaign to the zone you created earlier, and then grab that zone’s invocation code which will go on your website. Let’s start with linking the campaign to the zone. 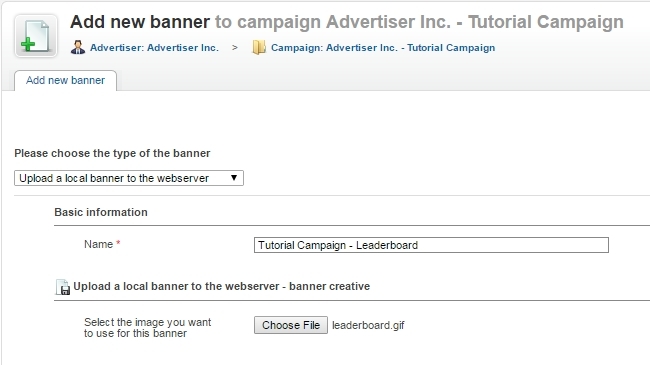 By linking the Campaign you created to the zone you created at the start of this tutorial, you’re going to instruct the ad server to consider the banners of the campaign for delivery when a request comes in on that zone. To go to the screen where you can link the campaign to the zone, click the Campaign’s name in the overview of the banners. Next, click the Linked zones tab for the selected campaign. A screen will present itself that enables you to select the zone (or multiple zones if you have them) that you want your campaign to be linked to. On the left half of the screen, there is a list of all the Available zones that exist and haven’t been linked yet. Using the mouse, click the check box in front of the zone’s name. Immediately, the Link button in the middle will be enabled. Click the Link button and notice that the zone you selected moves to the right half of the screen, under Linked zones, and it is no longer present in the list of Available zones. You do not have to save anything here, linking and unlinking takes effect automatically. All that remains now is to grab the zone’s invocation code and put it on your website. That’s the next and final step of this tutorial. To retrieve the invocation code that is associated with a zone, first navigate to the overview of zones for the website you defined earlier. The easiest way to get there is to first click the Websites link in the left hand menu, and then to click the Zones link for the website you’re working on. 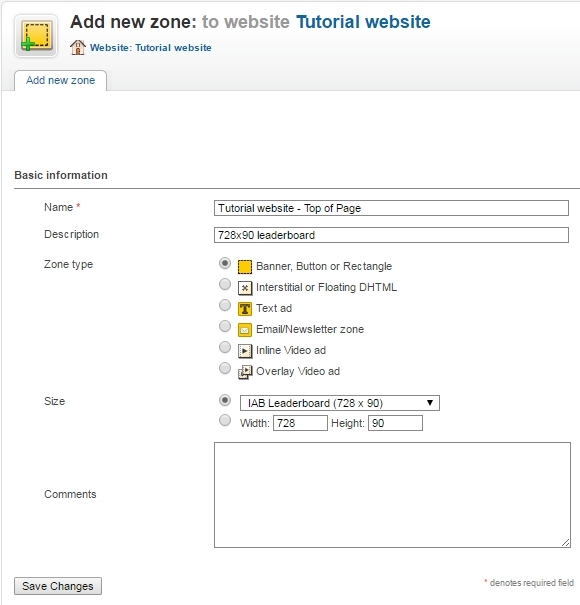 In this tutorial, there is only one website, so the zones link should be easy enough to find. Next, on the right hand side of the zone you created earlier, click the Invocation code link. This will open a page where the zone’s invocation code is displayed, ready to copy and then paste into your website. Just click anywhere inside the big box where the code is displayed, and then use your computer’s copy key combination (Ctrl-C in Windows) to put it on the clipboard. In fact, that’s exactly what has been done as the conclusion of this page. 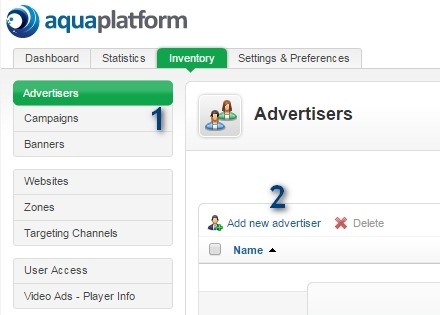 The banner you see below is served from the Aqua Platform ad delivery platform, after having been created following the exact same steps described above. If you studied this tutorial but do not have a Revive Adserver hosting account with us, feel free to click the banner above to sign up. You’re most welcome to become our next customer!